ENCHANTRESS is a grand ole dame. She has character and has been used in numerous film shoots over the last 10 years. She has made a trans-Atlantic crossing with her 9,000 gallon fuel capacity and walk-in freezer and walk-in refrigerator. She has had over $1,000,000 in upgrades over the last 10 years. Enchantress is an Aluminum hull yacht Built by Breaux Bay. Breaux Bay builds work boats to take supplies to the oil rigs in the Gulf of Mexico. The hulls are designed to handle heavy seas and carry a lot of cargo.You won't find many luxury yachts with a hull like this. The Flybridge is enormous, measuring 23' X 46'. It has been the centerpiece of numerous film shoots. With the forward complete bar, the entertaining capability is fabulous. 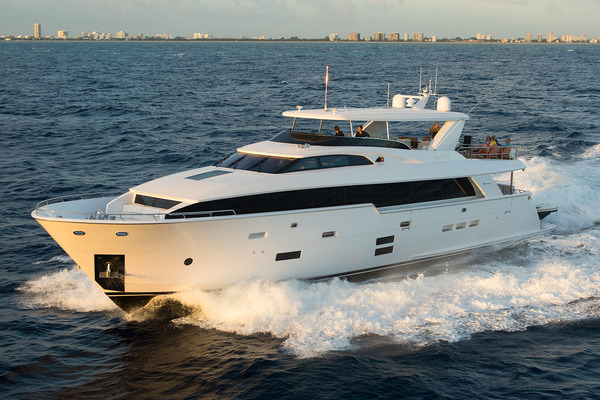 Access to the Flybridge is AFT using a spiral staircase or forward with stairs to the Pilothouse. Just FWD of the Flybridge is the Bridge House with more seating capacity. The Bridge House is full beam with considerable seating AFT and to Stbd. To port there is a stairway down to the Pilothouse. There is an instrument cluster that can drop down and be hidden when not needed--see photos. The AFT Salon is very bright with windows on both sides and AFT. There are wing doors on etiher side to the catwalks. Looking forward she opens into the massive Dining Room. On the Stbd. side is the spiral staircase that goes up to the Flybridge and down to the Master and Guest Staterooms. The Dining Room is full beam with large windows on either side. Forward to port is a swinging door to the Galley. Forward to Stbd. is the hallway with the Day Head. The Galley is located forward on the Port side. It is a fully equipped commercial kitchen. The Galley has a service entrance to Stbd directly to the Catwalk or from the dining room. There is a day head next to Galley entrance. The Master Stateroom is located aft of amidships below the salon and is accessed by way of a spiral staircase from the Aft Salon. The Master Stateroom is elegantly appointed and spacious. Two large Hanging Lockers to Stbd. The Forward Quarters are accessed by way of a stairwell immediately aft of the Pilothouse and just forward of the Galley entrance. Upon descending the stairs, the Engine Room ia AFT and the Companion Way goes all the way Forward to the bow. Moving Forward in the Companion Way, to Stbd is a Guest Stateroom with a queen berth. Across to Port is a Stateroom with 4 bunks. Forward of these are the walk-in refrigerator and freezer. Forward all the way to the bow is the Crew's Quarters. The Pilot House is accessed by a wing door on either side, a short hall to Stbd leading AFT or stairs to the Bridge. To Port is the Captain's Quarters and to Stbd is a large chart table. The large chart desk would make a great mobile office. The Captain's Quarters are to Port and AFT in the Pilothouse. The Crew's Quarters are all the way forward at the end of the lower Companion Way. They are just forward of the walk-in refrigeration. Breaux Bay Craft made a standard 100' Aluminum boat designed to service the oil rigs in the Gulf of Mexico. The hull was designed to carry heavy loads in all kinds of weather. So this is an incredibly sea worthy yacht and has made a trans-Atlantic crossing. In 1968, 1969 and 1970 Breaux Bay made 12 custom personal yachts. The commercial boat has 94,000lbs of AL. This one was has 120,000lbs. The commercial boat has a gross displacement of 100 tons. This one is 120 tons. In 2008 Enchantress had the bottom taken down to bare Aluminum, barrier coated and new bottom paint. She was also sounded and found to be fine.